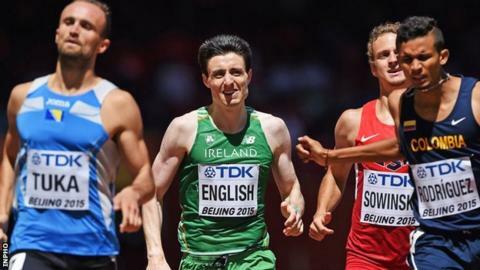 Mark English has progressed to the 800m semi-finals at the World Championships as a fastest loser in the heats. The Letterkenny athlete was fifth in his heat in 1:46.69 but did enough to make Sunday's semi-finals in Beijing. English, who needs a top-two finish to qualify automatically for the final, said he was "delighted" to make his first global semi-final. The 22-year-old UCD runner finished out of the medals at the European Under-23 Championships in the early part of July. "I knew if I got boxed in and was sitting any further back than fourth I'd leave myself too much work to do so I wanted to have no regrets," English added after his Beijing heat. Irish 400m hurdles star Thomas Barr missed out on a place in the final after finishing fourth in his semi-final.